Kick-off is set for 8pm under the lights at Nippert Stadium this Saturday! Come Early, Be Loud and Wear Black! 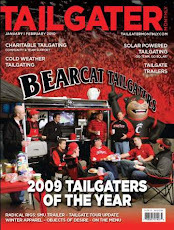 The Bearcat Tailgate Crew will be set up 4 hours prior to kick-off. This week's menu features your favorite Italian eats, ice cold Hudy Delight (a bearcat tailgater staple) and a Red Bull and Vodka Bar. We will be in the Schiel School Parking lot on the corner of W. Daniels and Short Vine across the street for Daniels Pub and the Sigma Sigma House. Just look for the Ultimate Tailgate Trailer (you can't miss us). As always, everyone is welcome...donations are appreciated.